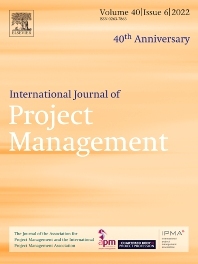 The International Journal of Project Management is the leading journal for the field of project management and organization studies. Its mission is to publish leading edge innovative research that significantly advances the field of project management and organizing. Published eight times a year it presents new knowledge on areas such as managing projects, programs and portfolios, project-based/oriented organizations, project networks, and project-oriented societies. It is dedicated to project management and organizing from the perspectives of organizational behavior, strategy, change, and innovation. Methodologically, IJPM covers the full range of empirically-based modes of enquiry using appropriate research frameworks, provided they demonstrate generic insights of significant value to project management. IJPM does not categorically exclude certain empirical methodologies, except however purely mathematical modeling or operations research pieces. Irrespective of the mode of enquiry or methods used, the key methodological issues in new submissions are: appropriateness of methodology to the research task, clarity in how the study has been carried out, rigor in the application of the methods, and consideration of relevant validity issues. Papers are also expected to explicitly build on current debates in recent literature and to contribute to theory. Occasionally IJPM publishes conceptual papers which fulfill a high-quality standard. IJPM welcomes work from scholars worldwide. All work must meet a high standard in content, structure, and language and is assessed for relevance, originality, and quality through a rigorous peer review process. Important for each submission to the journal is that there is a direct focus on managing projects, programs, and portfolios as well as project organizations and societies. IJPM is an academic journal where unique and original research is published. Therefore, our primary readership are academic researchers and students in the field. However, we also aim that research published in the journal is practically relevant, so that the results are useful for managers in leadership roles related to projects, programs, and portfolios. Therefore, both theoretical and managerial implications of the research need to be considered. In other words, we seek great contributions to both theory and practice and we strongly value both rigor and relevance. The scope of the journal covers all project types, such as organizational development, strategy, product development, engineer-to-order manufacturing, infrastructure and systems delivery, and industries and industry-sectors where projects take place, such as information technology, engineering and manufacturing, construction, consulting and professional services, and the public sector including international development and cooperation etc. Authors are encouraged to take into account the specific type and context of projects in their research, but at the same time consider and discuss the implications of their findings for project management and organizing more generally. In other words, the theoretical implications of a contextualized understanding of projects, and their management, is vital.